Celebrating Christmas this year Heathrow Airpot, the Europe's largest airport has commissioned Michelle Wibowo to create 5 meters long and 2.5 meters wide massive gingerbread installation at Heathrow Airport Terminal 5. It took Michelle 200 hours to make and weighs around 50kgs! The gingerbread airport features Heathrow’s four terminals, the runways and the control tower as well as the much loved stars of Heathrow's Christmas advert, Doris and Edward Bair. Heathrow discovered that one in four Brits (25%) believe that the smell of gingerbread is the main scent that reminds them of the festive season The gingerbread airport is in Heathrow Terminal 5 on Thursday 13 December. Gatwick Airport is the world's busiest single runway airport as well as the first airport in the world to combine air, road and train travel in a single unit. These are just some of the many impressive statistics for Gatwick Airport and the concept is to show these in the cake! 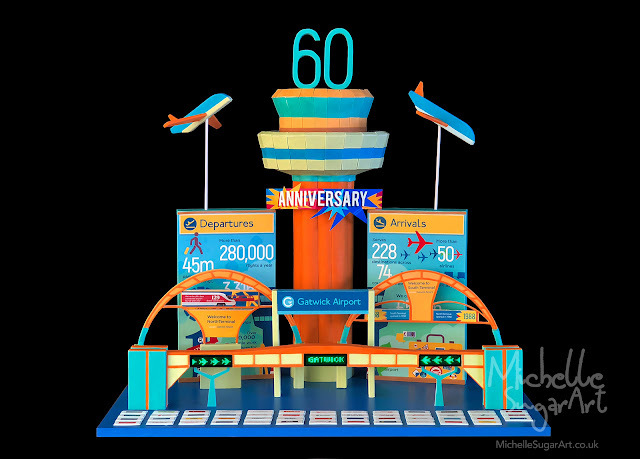 Michelle started by carving layered of vanilla sponge cakes sandwiched with generous buttercream and covered with sugar paste for the main airport tower. She also made the arches for the North and South Terminal as well as the iconic bridge. 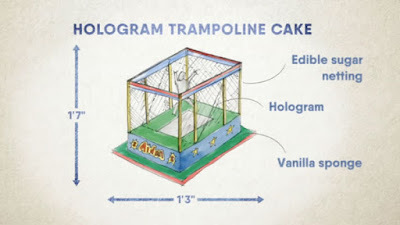 She also designed and printed the impressive InfoGraphic into edible icing which then later used to cover the sponge cake. To top it off she also installed LED strips showing messages to congratulate Gatwick's 60th Anniversary. Michelle created a pottery theme cake for BBC Show Marrying Mum and Dad, where the kids are making all the big decision about their parent's wedding day including theme and the cake!. Working in collaboration with Mr Kipling's brand, Michelle Wibowo of Michelle Sugar Art reveals the 3 meter tall (sitting down) or about 7 m tall when standing up a life-size giant sculpture of Big Friendly Giant (BFG) from one of the famous Roald Dahl's Children storybook. The sculpture was covered with around 7500 individual Mr Kipling's cakes from 7 variety, the skin was made using Viennese Whirls, his trousers and top half are made from different types of Angel Slices, plus a few Bakewell tarts around the shirts. Star Wars theme party won't be complete without a vicious Darth Vader birthday cake, complete with red lightsaber, sound effect and illuminating LED lights for a lucky birthday boy! Sorry Mr Vader, we had to wrap you in cling film during transporting! 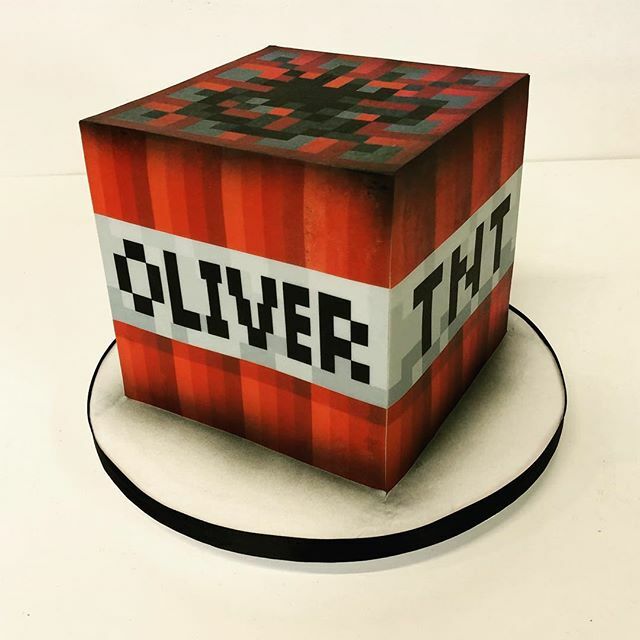 This weekend, I've made this birthday cake for a friend who is a big fan of Minecraft Computer Game. The cake is rather simple it's made of 2 layers of chocolate sponge cake with a generous amount of buttercream in between. The trickiest part of the project is to make sugar paste completely flat with sharp edges. If you wish to find out how to do this please do let me know and drop me a quick message.